Everyone has those clothes hanging in your closet that you have good intentions for, but you never aaaactually wear. I’m hanging on to some jeans that don’t quite fit anymore, but I keep swearing to myself that I’ll be able to squeeze back into them… soon? Today’s client was doing an off season clothing swap and needed to pair down some of her clothes that she had good intentions for, but didn’t really ever wear. A great way to manage those off season clothing items is to store them separately from your in-play items. Whether in another closet, in bins in your attic or garage, or just at the back of your closet. 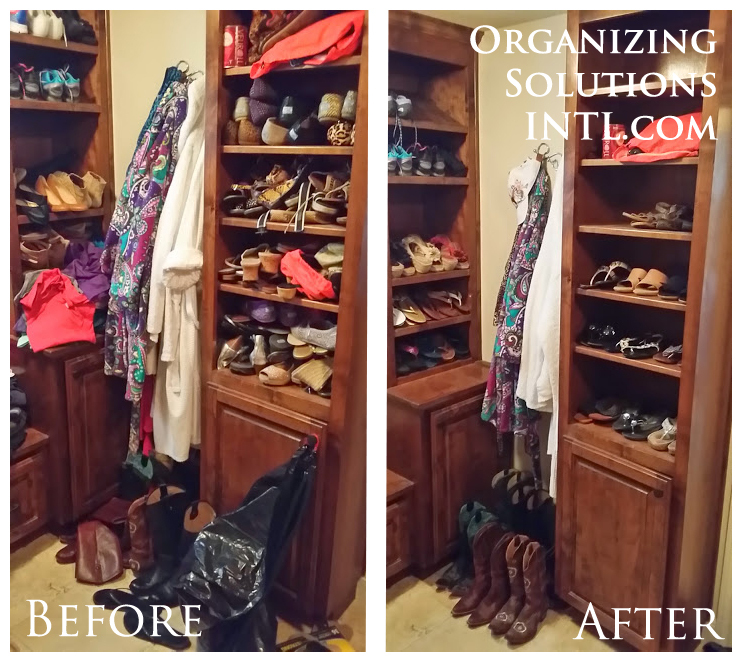 She also worked some major magic with her shoe storage and was able to let go of several pairs of shoes that she didn’t wear anymore. Now, all of her winter clothes are stored nicely in the cedar closet and her upstairs, bedroom closet houses the cute summer dresses and items she’ll need through these hot Texas summers!